Behind Maine’s breezy coastlines, majestic mountains, and lush wildlife lies a scathing and painful past. 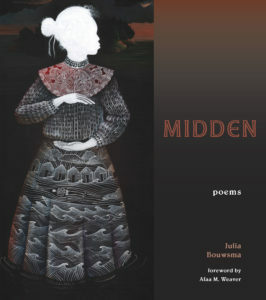 The story of the displaced peoples of Malaga Island is one that is hauntingly illustrated in Julia Bouwsma’s Midden. Bouwsma beautifully gives a voice to those that were silenced by a racist state once obsessed with eugenics, committing horrific crimes against humanity to the sole inhabitants of the a small, coastal island at the mouth of the New Meadows River. In the early 1900s, racist politicians and greedy developers worked together to successfully wipe out the forty-five inhabitants, who were mostly white or African diaspora, through mass sterilization, forced displacement of the living, and an eradication of burial grounds. In present day, we have the words of artists like Bouwsma, that when combined with findings from archaeological excavations beginning in the early 2000s, allow us to shed light on the lives, and untimely deaths, of the Malaga peoples, who are no longer silenced. Midden has received numerous accolades from respected organizations and individuals, such as being selected as one of NPR’s Best Books of 2018, or a feature on Book Riot as one of 2019’s Must-Read Poetic Works. Bouwsma’s poetry has received stellar reviews for its “chilling commentary, [which is] compassionate and character driven” (Patricia Smith) and for its use of “lyric, persona, and lyric narrative to investigate these histories of violent displacement, gentrification, and incarceration” (Aracelis Girmay). To learn more about the history of Malaga Island and its peoples, click here. To purchase this work on Amazon, click here. An impressive share, I just given this onto a colleague who was doing a little evaluation on this. And he in actual fact purchased me breakfast as a result of I discovered it for him.. smile. So let me reword that: Thnx for the deal with! But yeah Thnkx for spending the time to debate this, I feel strongly about it and love studying extra on this topic. If attainable, as you turn into experience, would you thoughts updating your weblog with more particulars? It is highly helpful for me. Huge thumb up for this blog post! I used to be very happy to search out this internet-site.I wanted to thanks in your time for this glorious read!! I positively enjoying each little little bit of it and I have you bookmarked to take a look at new stuff you blog post. Thank you for sharing excellent informations. Your website is so cool. I’m impressed by the details that you’ve on this site. It reveals how nicely you perceive this subject. Bookmarked this website page, will come back for more articles. You, my friend, ROCK! I found just the info I already searched all over the place and simply couldn’t come across. What a perfect web-site.